This blog hop is kicking off the ELEVEN newest releases here at Ink Blot Shop! I had such a blast designing them all and hope you love them as much as I do! I love that the MISTI made it easy to stamp some coordinating envelopes as well. For these I used the Envelope Mail Art set on the front of the envelope and the Arts & Crafts Sentiments on the back flap. And, if you look closely, you can see where he tried to draw my logo and write my website address on there (and then erased it)...made this momma's heart smile. Now, I'm not saying you hopped today just to try to win free stuff...but I'm also not saying you didn't. So, would you like to win the stamp sets that were used to create my cards and envelopes today? You can! Leave a comment on this blog post. (Tell me your favorite stamp set from the newest releases.) That's it! Comment on any of the posts associated with this particular giveaway on the Ink Blot Shop Facebook page and/or the @InkBlotShop Instagram account. Blog comments for the giveaway will close Sunday, March 3rd @ 11:59pm (Central) and the winner will be announced Tuesday, March 5th here on this blog. - The winner will have 72 hours to contact me with their information. - Due to shipping costs, giveaways are available to US mailing addresses only. 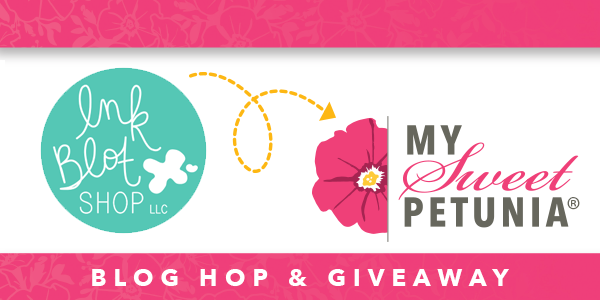 After leaving a comment, be sure to hop on over to My Sweet Petunia's site to continue on the hop. I just found your site today. Love that little something set and the botanical borders. Really nice stamps you carry. Thanks for the opportunity to win. I ❤️ This entire release! If I had to pick my favorite I would say it is the botanical borders but my favorite for my essentials would be grounded! I can’t wait to get my hands on them and get them Inky! My fave from this release is Botanical Borders, such a wonderful mix of images and I really like the Get Grounded set, such a clever idea! My favorite at this second (it keeps changing so many fabulous choices!) is Botanical Borders it just inched out the get grounded (such a brilliant stamp set!) Thank you for sharing your wonderful talents with us. Your kiddo also did a wonderful job on their card panel. Love that they can do this with you! SOOOO CUTE! I love the Little Something Stamp! The whole release is FAB!